A 2010 US Geological survey put the total amount of recoverable gas in the Levant basin, situated in the eastern Mediterranean, at 122 trillion cubic feet (tcf). Cyprus’ share of this lies in what is now called the Aphrodite field. Officials estimate the net worth of the natural gas to be around $23 billion – more than 100% of the entire Greek Cypriot economy. This discovery coincided with the financial meltdown and near economic collapse of the internationally recognised, Greek Cypriot administered Republic of Cyprus (RoC). In 2013 the economy of Cyprus shrunk by 6% and unemployment levels reached a record figure of 17%. The government was in such dire straits that it was forced to levy a one-off tax on bank deposits exceeding €100,000, and remain the only country to do so in the EU. Viewed from this angle, it appears the struggling island has been blessed with a new lifeline. The Greek Cypriots have been quick to begin preparations for the exploitation of these reserves. The RoC has divided the sea to the south of its coast into 13 blocks and authorised different licences for prospection, exploration and exploitation to a number of global energy companies. The speed at which the government is moving to exploit this resource reflects the severity of its economic situation; the development of the Aphrodite gas field has the potential to not only decrease Cypriot reliance on energy imports, create jobs and reduce its massive GDP-to-debt ratio, but also promises to foster cooperation in a highly volatile region. Herman Van Rompuy even went as far as to suggest that the sharing of gas between the Turkish Cypriots in the north, who also have a claim to the gas, and the Greek Cypriots in the south could lead to peace and reconciliation. Natural resources can act as facilitators and sustainers of peace in deeply divided societies; however, they also hold the potential to exacerbate tensions. To avoid the latter scenario the international community must guide the actors to establish the necessary institutions for the stability and economic prosperity of Cyprus and the eastern Mediterranean. Currently, the official line of the RoC is to construct an on-shore Liquefied Natural Gas (LNG) terminal. Selling gas in LNG form would allow the RoC to sell its gas to the more competitively priced Asian markets. The main problem with the LNG terminal, however, is its cost. The recent reduced estimate of gas in the Aphrodite field from 7 tcf to 5 tcf have, for the time being, rendered an LNG terminal cost-ineffective. Cyprus thus hopes to court Israel, another country in the region with considerable natural gas reserves, to export its own gas through an LNG facility in Cyprus. No decision has been taken on Israel’s part to date, and the contested nature of energy exports in Israel pose significant obstacles. Furthermore, JP Morgan suggests that a pipeline from Israel’s Leviathan field to Turkey would yield a faster and higher return on investment than a proposed LNG plant in Cyprus. A more cost-effective option however would be a pipeline connecting Cyprus and Turkey. A report published by the PRIO centre in Cyprus estimates that a pipeline to Turkey, as opposed to an LNG plant, would be much more profitable. The option of building a pipeline to Greece is also much less profitable than a pipeline to Turkey. It appears that in economic terms, both Israel and Cyprus are better off piping their gas to Turkey. So if the mathematics make sense, what then of the politics? For a start, Turkey does not have any diplomatic relations with the RoC. Turkey has even sent its own vessels to conduct research in a number of Greek Cypriot licensing blocks where international energy companies are in operation. In fact, Turkey recently expelled a Norwegian vessel conducting research for the French oil company Total from one of the blocks where the RoC had granted a licence for gas exploration. In a recent visit to Cyprus, I interviewed Kudret Ozersay, who is now the chief negotiator for the Turkish Cypriot side. Ozersay points to the current political status quo as the biggest obstacle to any form of cooperation with the Greek Cypriots in the field of gas, arguing that, “the current stability creates a safe area for the international community to continue and maintain their existing policies.” Accordingly, international actors that have the capacity to push both sides in Cyprus towards a solution lack the necessary incentives to do so. In other words, the political climate in the eastern Mediterranean benefits, rather than costs, EU member states, the United States and global energy companies. Consequently, Turkish Cypriots have adopted a policy of reciprocity vis-a-vis Greek Cypriot exploration for hydrocarbons; the Turkish Cypriot government has designated its own blocks of prospection, exploration and exploitation, owing to the refusal of the RoC to allow them to take part in the decision-making process. 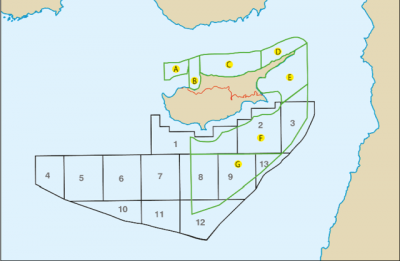 Significantly, it has licensed the Turkish Petroleum Company to carry out exploration and exploitation within blocks that overlap with Greek Cypriot claims, including the block that houses the affluent Aphrodite field (Block 12). Turkish Cypriot licensing blocks (green) overlap with Greek Cypriot licensing blocks (black). Turkish MFA/all rights reserved. A scenario in which both sides explore, drill and exploit the gas in Aphrodite would be inconceivable to the international energy companies active within this area. The strategy of reciprocity is thus a response to what Turkish Cypriots perceive to be unilateral Greek Cypriot initiatives regarding the issue of natural gas. Creating an atmosphere of instability could compel the EU, the US and energy companies to adopt policies more favourable to northern Cyprus. While this may seem like a risky strategy, Ozersay noted that “all the main actors including the EU and the UN, the US and even some of the Greek Cypriot leaders, have described these resources as belonging to both communities, we [Turkish Cypriots] are described as some form of a co-owner of these resources.” Thus, Turkish Cypriot exploration and exploitation activities appear in accordance with international law to some degree. Ozersay argues that ultimately the mutual financial and strategic interests of Greek Cypriots, Turkish Cypriots, Turkey, Israel, the EU, the US and energy companies will converge. The option that makes the most financial sense is a pipeline to Turkey, which might be possible even in the absence of a comprehensive settlement. On the other hand, Constantinos Adamides, lecturer at the University of Nicosia, paints a rather bleak picture of the situation: "I see it being very difficult for any Greek Cypriot politician to accept some pipelines to Turkey, prior to a settlement to the conflict, even if that means losing billions of Euros.” Furthermore, Adamides observes that, “Greek Cypriots seem to be willing to sacrifice potential wealth than to engage in any cooperation with Turkey without the necessary safeguards that could stem from a settlement." This does not bode well for the argument that natural gas could act as a confidence-building measure in peace process with a long history of mistrust. More than just a minimum level of trust is required for collaboration in the field of energy. On paper, the absence of recognition between the Turkish and Greek Cypriot governments prevented the RoC from buying electricity; however the two sides have bypassed this obstacle through a number of creative loopholes and shortcuts. For such an essential commodity as energy, the absence of trust and recognition has not prevented cooperation. This signals the possibility of future collaboration within Cyprus, without necessarily reaching a comprehensive settlement, though those involved with the peace talks stress the need for a comprehensive solution regardless of existing cooperation. US interests and subsequent efforts to restart peace talks were pivotal to the renewed negotiations. The visit of vice-President Joe Biden to the island is testament to Cyprus’ crucial position to US energy concerns. Washington wants to restore the once special relationship between Israel and Turkey – its strongest allies in the region – through cooperation in natural gas, and avoid a situation where the Turks and Turkish Cypriots balance against unilateral Greek Cypriot energy initiatives. Accordingly, a pipeline connecting Israel, Cyprus and Turkey appears desirable given the potential stability and interdependence this option offers. Moreover, this scenario would allow Europe to decrease its heavy reliance on Russian gas imports. An Israel-Cyprus-Turkey pipeline could be connected to the proposed Trans-Anatolian pipeline, and supply the EU through the so-called Southern Gas corridor. The recent annexation of Crimea by the Kremlin and the EU’s failure to respond effectively reflects the urgent need for Brussels to diversify its energy supply. This arrangement still leaves the divided capital of Nicosia in a vulnerable position; after all, what stops Turkey from turning off the taps for political gain, similar to when Russia cut off supplies to the Ukraine in 2006 leaving a number of European countries struggling through the winter months. This scenario is unlikely for a number of reasons. Turkey has a fast growing economy hungry for natural gas, and is on course to becoming one of the world’s leading energy hubs supplying much needed gas to European markets from its resource-rich neighbours. Furthermore, Turkey has consistently adhered to its contractual obligations, presenting itself to be a reliable partner. Secondly, Turkey’s southern coast is in rapid need of energy to supply its numerous development and infrastructure projects. To this end, the Turkish government has commissioned the construction of a highly controversial nuclear plant in Akkuyu off Turkey’s southern coast. A natural gas pipeline connecting Israel, Cyprus and Turkey could render the nuclear facility obsolete, or at the very least, dissuade the construction of other nuclear plants throughout Turkey. Whether the natural gas translates into a lifeline to peace or another missed opportunity, only time can tell. However, most signs point towards the former, as the cost of forgoing collaborating promises this time around to affect not only the Cypriots, but also the geopolitical giants with a stake in the region. Ultimately, the failure to harness this opportunity could result in a United Cyprus remaining nothing but a pipe dream.